The easiest way is to use the area under Email Marketing called “Email Reports”. Now you will have to make sure all the email reports for the dates you require are refreshed and this unfortunately is only possible by clicking on the refresh icon for each of them individually. 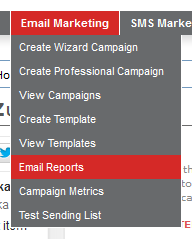 When you go to the “Email Reports” screen it will first list ALL eDM campaigns sent from the system over time. You can specify using the left hand side listing menu reports for each business dept. For instance you can go to Entertainment > 2014 > June to view all the eDMs sent for Entertainment in June. And using the “Export to CSV” icon in the top right hand corner export this data into a CSV file. You will need to use the CSV file to work out a percentage for each.